Update: See my new 18 liter pack setup. In a week I’m leaving the United States and I have no idea when I’m coming back. The deal with myself is that I’ll be gone for at least six months and up to two years. Maybe I’ll come home for Christmas but in general my plan is to travel until I run out of money. In planning the trip I first tried to find the largest luggage that airlines allow as carryon. That wonderful bag is called Tom Bihn Aeronaut: 35 liters, ultra-light and durable Japanese fabric, backpack straps, and an optional shoulder strap. If you’re going to travel with the maximum sized carryon it’s basically perfect. 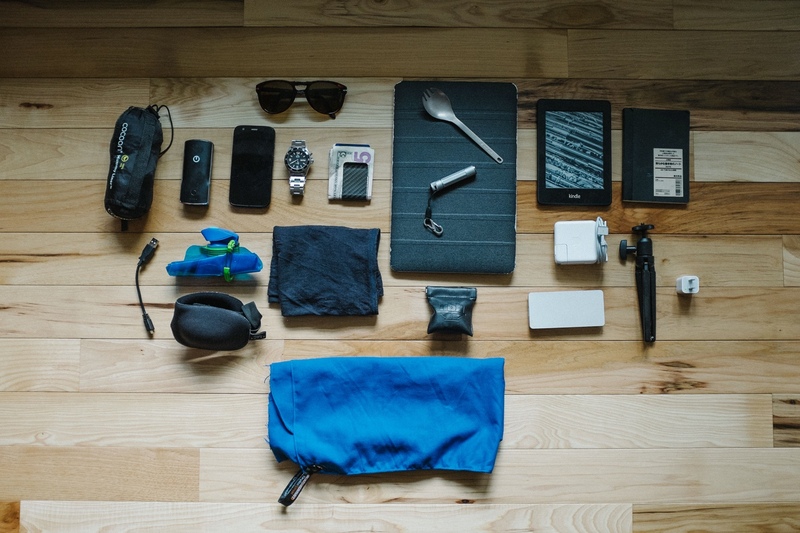 Last November I took the Aeronaut to Thailand for two weeks and it did a wonderful job. Everything I needed fit inside comfortably. 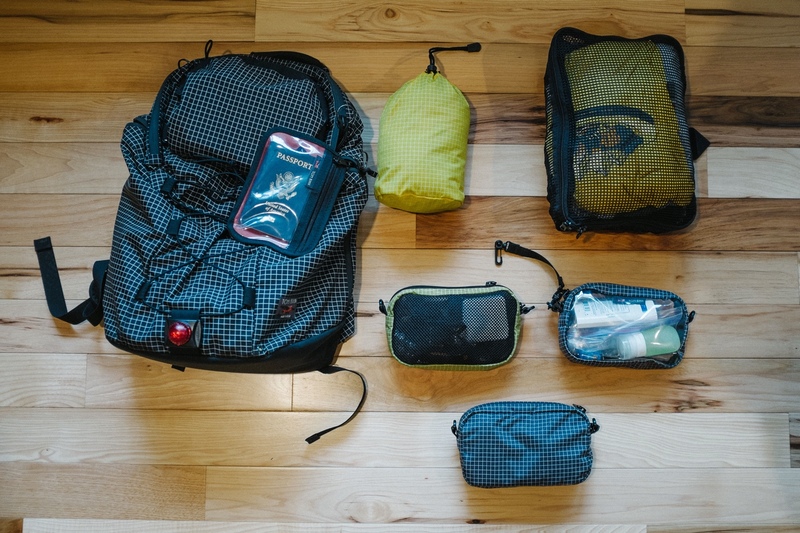 The mesh packing cubes are perfectly designed to hold anything you want and the end compartments are great for dirty shoes or rarely used clothes. But in Thailand I learned the burdens of even small luggage: it’s still heavy and bulky. I wanted to drop my bag as soon as I could and ran from hotel to hotel instead of wandering more freely. For my upcoming trip “around the world” I’m packing as little as I can carry and still function normally. My bag is 26 liters and weighs 13 pounds fully loaded. 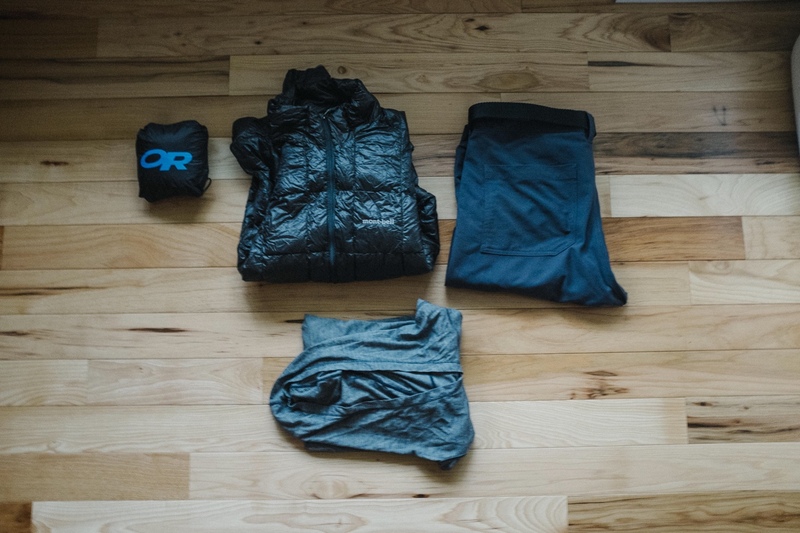 It’s basically three shirts, two pairs of underwear, shorts, a bathing suit, cold weather and rain gear and a few minimal accessories. There are a couple things in the bag right now that will probably get ditched once I hit the road, and even now I think it’s too heavy. Even though the pack is light it covers almost every situation imaginable: hot, cold, swimming, working out, gross outdoor hikes and nice dinners out. It has enough photography gear to shoot a wedding. I might be traveling light but I’m definitely not traveling minimal. My inputs were to pack as light as possible knowing that it’s OK to miss things and buy them later. I also tried to buy things that were multi-purpose. Since I had tons of time I ordered two or three of every option and picked my favorite. What I’ve packed is a balanced system. I don’t need a hood on my down jacket since I have a hat and a hoodie already. I don’t need workout shoes since I’m already used to exercising barefoot. Some things can be altered: my foam inserts let me turn ultralight hiking shoes into comfortable everyday sneakers. 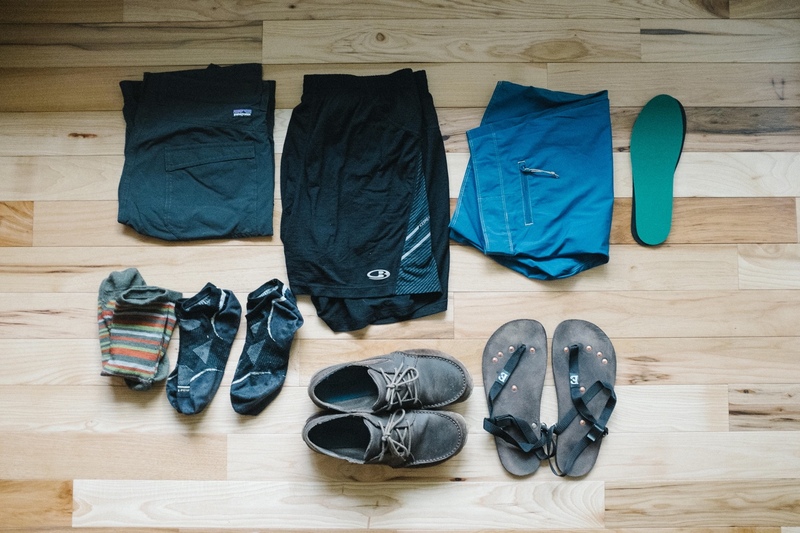 There are a ton of gear blogs full of around the world packing lists and recommendations. Most of what I’m bringing came from Tynan’s gear lists for 2014 and 2012. I can back these recommendations up because in almost every case I tried several alternatives before coming back to his recommended gear. Tom Bihn is the best bag company I’ve found. I tried the Aeronaut, both the 19 and 25 liter versions of the Synapse and the Smart Alec. In the end I like the Smart Alec the most because the single large interior compartment lets me move things around to balance weight and the removable storage cubes let me setup and break down the bag into a full travel bag or a small day pack. The Smart Alec broken out into it’s separate stuff sacks and containers. I have a mesh organizer for frequently used electronics, a clear cube for toiletries, a solid organizer cube for small stuff and extra earplugs. All of these clip into internal o-rings, then pull out and can be left behind for the day. Other things worth checking out are the clear organizer pouch for storing credit cards and passports, the travel money belt, the small blinking visibility light for the back of your pack, and the laptop cache for laptop storage. All of my clothes fit, with a bit of a stretch, into a single small Tri-Star packing cube. Everyday shorts:Patagonia Rock Craft. These seem extremely durable and don’t have dorky cargo pockets. They replace my old ExOfficio shorts which I was told look too nerdy for wearing outside. Workout shorts:Icebreaker Sonic. Very comfortable and don’t smell at all after multiple workouts. The only downside is that they lack pockets. Swimsuit:Patagonia Men’s Light and Variable Board Shorts. Not much to say about these except they are light and very thin. They also could reasonably pass for shorts. Foam inserts for my everyday shoes to give them more padding. Sandals are the Ultralight Earth Runners. I need more time with these to recommend them but so far I’ve walked all 4-5 miles across San Francisco several times they have been very comfortable. Plus they look like something a Roman would wear. Everyday shoes are the Merrell Barefoot Reach Glove. They are comfortable, look really good, and have barely worn in six months of constant use. I have shoe inserts for days with tons of walking. Three pairs of socks: thick icebreaker socks and thin smartwool socks. One gray Appalatch V-neck for casual wearing. I love the fit but this might get ditched for weight savings. One yellow Icebreaker T Tech for working out and sunny days. One black Icebreaker Anatomica V-neck for everyday and more formal stuff. The best underwear I’ve found are the Icebreaker Anatomica Boxers. They are comfortable and dry quickly. Since they’re made of wool they barely smell at all even after being washed in the sink for days. I also have the Icebreaker Leggings as a layer to go under my pants on cold days. Rain Jacket: Hands down the Outdoor Research Helium 2. It’s only 6.4oz, folds down very small into its own pocket, and does an excellent job keeping me dry. It’s much smaller packed down than any other rain jacket I’ve owned. Credit to Tynan’s blog. Down Jacket: My favorite was the MontBell Ex Light, only 5.6 ounces with no pockets or hood. It’s super warm and when layered with my hoody and rain jacket I’ll be comfortable down to probably 30F. The Patagonia Ultralight Down Hoody is also very good but bigger and almost twice as heavy (9.6oz) . Credit to Tynan’s blog. Pants: The Rohan Stronghold Trousers. Rohan deserves credit for being the only retailer I found listing pack volume and drying time for all of their clothes (1000ml, 6 hours). Their styling is sleek and their colors are fashionable. I’ll be traveling with blue pants. I also tried the Icebreaker Seeker pants (pros: fashionable, partially wool. cons: too thick, partially cotton), the Columbia Global Adventure Pant (pros: very comfortable, cons: colors and seemingly too thin) and the Bluffworks pants (pros: comfortable, sleek. cons: bad colors, look like business wear). Hoodie: The NAU M2 Hoody is the best hoodie I found. It’s fashionable, light, and I’ve worn it for weeks without any smell at all. Credit goes again to Tynan’s blog. I also tried the Icebreaker Quantum but found that it was too thick and duplicated warmth I can get from the down jacket. OWC Envoy Pro SSD Drive. RBH EP2 Headphones rated the best pick by The Wirecutter. I also tried B&W and Etymotic headphones which were both uncomfortable. Sleeping mask. The best part about this particular mask is that I doesn’t touch my eyes at night, so I can open my eyes while wearing it. Mini USB 3 cable for charging my phone, battery charger, and Kindle. Collapsible Vapur Element water bottle. Most of the time I’ll have to drink bottled water so there’s no point in having a bulky aluminum or solid plastic bottle. Wool Buff hat/scarf thing. Probably my least fashionable item by incredibly functional. Motorola Moto G phone. Big screen, reasonably fast, very cheap ($200 unlocked). It’s on T-Mobile which gives me 2G data worldwide for $50/month. Best feature is that the battery life is insane and at the end of a day of heavy use I generally have 30-50% left. This can get stolen three times before I’m out the cost of one unlocked iPhone 5S. Fashion item: Orient Black Mako watch, about $120 for a fully automatic Rolex clone. Gratuitous carbon fiber money clip. I came really close to shooting the whole trip on film and was going to carry a Zeiss Ikon with a 50mm F2 lens. Finally I read that Sebastião Salgado has switched to digital and realized it was insane not to do the same. I’m bringing a Fuji X100S with a built in 35mm equivalent lens. It was purchased used from Amazon Warehouse Deals. The camera is fantastic. I was trying the Fuji X-Pro1 for several weeks but this is so much faster and lighter that I’ve decided to bring it instead. I’d still kill for a Leica M240 but honestly can’t afford it with two lenses (about $10,000). For a camera case I may just use a Domke Wrap. It’s really easy to get the camera into and out of the wrap and provides decent protection. All together this kit weighs 13 pounds and fits into a 26 liter pack. I’m sure that a few of these items will be ditched sometime during the journey when I decide they are too heavy or infrequently used. I’m already considering ditching one of the shirts (probably the Appalatch), the Patagonia climbing shorts, and one pair of socks. I expect that after lugging all of this around for a few months I’ll even ditch some of the stuff that I think is totally necessary right now.